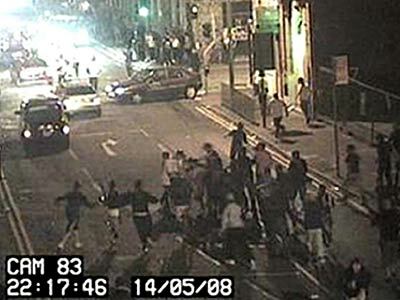 The recent riots that took the whole of the UK by surprise was not simply a race riot. Yes, Duggan was black and there are strong correlations between race and class but skin colour had nothing to do with the looting. Some of the worst violence happened in majority-white-neighbourhoods like Croydon. There is something deeper that caused this havoc and it includes all groups: black, white and brown. The rioters appear to be far more socially diverse than mere apellations of social depravity. Among the first looters who appeared in the courts this week were a graphic designer, a youth social worker, an estate agent, a teaching assistant, a forklift operator, a lifeguard, a chef, a postman, a hairdresser and students. How representative these are of the rioters as a whole remains to be seen. The picture emerging, however, is one of riots in which it was not just the jobless and the poverty stricken who were causing the mayhem. What the riots reveal thus far is a far more deeply embedded depravation not of materialistic economic needs but a moral and religious depravation. Television pictures of a group of youths pretending to help a young man injured in the riots while casually robbing him were flashed across the world this week, pictures that seemed to express the moral deficit of the rioters. It is striking how little the rioters seemed to care for their own communities and how self-destructive their actions appeared to be. The relentless promotion of the market ideology over the past three decades has helped fragment society, tearing apart social bonds and creating a nation of isolated individuals. In many communities the authority of institutions, from families to trade unions, that once socialized young people and inculcated moral values have been broken. At the same time, the introduction of the market ethos into every area of life from education to health to the arts has helped institute an instrumental ethic in which all that has come to matter is value for money and in which wider social needs and moral issues have been ignored. At the same time, politicians have increasingly taken to blaming the poor themselves, rather than their social and economic policies, for the breakdown of family life, a lack of social values, a selfish disregard for the needs of others, and a rampant consumerism. The same values that many tolerate among bankers are condemned in the poor and the unemployed. And with condemnation has come repression, from increased CCTV surveillance to punitive workfare rules. Ironically, perhaps, the way forward has been shown by some of those who stood up to the rioters. In many communities, local people patrolled the streets, protected buildings and confronted rioters. They did so largely because the police were unable or unwilling to help. In one sense, such community action helps camouflage the government’s public expenditure cuts, making up for the services the state should be providing. But, in another sense, such action is much more than an ersatz form of Cameron’s Big Society. In taking matters into their own hands, and in accepting responsibility for their own communities, those who stood up to the rioters were taking the first steps towards restoring the moral deficit by recreating the bonds of social solidarity. Fundamentally (!) I agree; the moral instinct is ultimately grounded in conformity with the Divine will and our God-given nature. Yet on a practical day to day basis, irreligious people function perfectly well as moral agents despite the untenability of a secular justification for morality. Non-believers can behave just as morally as the best of believers whilst believers can and do behave as badly as the worst non-believers. I would be pleased to read how the riots are symptomatic of the UK’s rejection of God. As believers, this is a conclusion that we can all easily jump to but cogently presented arguments that support this insight is what is needed if the religious viewpoint is to be taken seriously. Or are we to continue to speak truths to each other in a closed room whilst the battle rages outside? Apart from the solitary reference to ‘religious deprivation’, nothing in what I read in the original post would be unusual if I had read it in such secular bastions as the Guardian or New Statesman. And the ‘way forward’ described in the conclusion was remarkably religion free. Those are fair remarks that I cannot contest. Perhaps the point that I was making was not as self-evident as I had assumed; it might have been more appropriate to have raised it in the context of the more recent riot in Madrid, but even here I’m sure there are plenty more reasons to justify the response.